To expand network capacity, providers are packing more cell sites into specific geographic areas. Low-power antennas, including small cell and DAS (distributed antenna system), are being overlaid to supplement current coverage and capacity. They also enable mobile devices to reuse available spectrum. Approximately 62% of Verizon’s wireless deployments in 2017 were small cell, DAS nodes, and small 5G base-station equipment. Sprint plans to deploy roughly 40,000 outdoor small cell solutions, and T-Mobile plans to roll out 25,000 small cells within the next year. T-Mobile deployed approximately 18,000 small cell and DAS nodes at the end of 2017. Small cell and DAS are the key infrastructure to enable 5G, but they also represent future revenue potential and competitive advantage for telecoms. 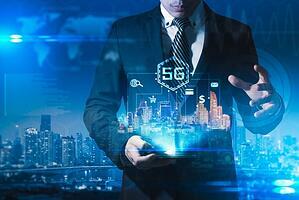 “5G is not just about better phone coverage,” noted Colby Synesael, Managing Director and Senior Research Analyst at Cowen & Co, who has been closely tracking the technology. Faster wireless will enable new services. Communications companies expect it will monetize utility infrastructure to offset installation costs. How are Small Cells and DAS Deployed? Understanding how small cell and DAS are deployed can help joint use owners prepare for attachment permitting and other relevant joint use activities. Small cell and DAS do not generate a cellular signal; they distribute an existing signal. An external radio frequency (RF) source feeds a signal to the small cell, which distributes the signal to its network of antennas. Then, it distributes the signal to users. Small cell and DAS need both antenna and transmission equipment; this equipment is installed on joint use infrastructure. Outdoor DAS and small cells are designed for low-height antennas, which often have limited coverage and need to address abundant interference. Even foliage can interfere with the wireless signal. While each individual small cell node requires its own dedicated power source and backhaul source, DAS is composed of multiple remote antennas that all connect to a single base transceiver station (or multiple transceivers to serve multiple carriers). Communications companies, government entities, and other stakeholders are working on regulations that will streamline deployment of the necessary infrastructure for 5G. The current infrastructure environment means that providers often choose to install small cell in situations that would be better served by DAS. For example, providers may submit applications for small cell in downtown core areas where DAS would actually make more sense. In some cases, providers apply for permits on adjacent poles, where DAS may reduce visual clutter. A DAS that serves multiple carriers needs a concentrated and coordinated effort, as well as someone to manage the project. Small cell is easier to deploy. DAS applications are reviewed in total – an objection to any part of the DAS application holds up the entire request. Each wireless provider has different objectives and may not need the same locations. Each wireless provider has different deployment times, and requiring DAS may force one carrier to wait if others are not ready. DAS costs more because it is designed for requirements of the most advanced user. So, if carrier A needs feature X (even if carrier B doesn't) then the system will include feature X. Companies deploying small cell must negotiate agreements with local municipalities. This can sometimes be a complicated and lengthy process. While communications companies are trying to figure out the best way to continue expanding their networks in support of future bandwidth and coverage needs, joint use owners are struggling to meet the increasing demand of attachment permitting for small cells and DAS. Joint use owners are looking for strategy, and telecoms are working to deploy quickly and in large amounts. How can the two work together? Stay tuned for the next few blog posts on small cell deployment. We will feature topics for both owners and attaching companies. Share your thoughts on 5G, small cell, or DAS in the comments. Help us start a dialogue about these current industry trends.